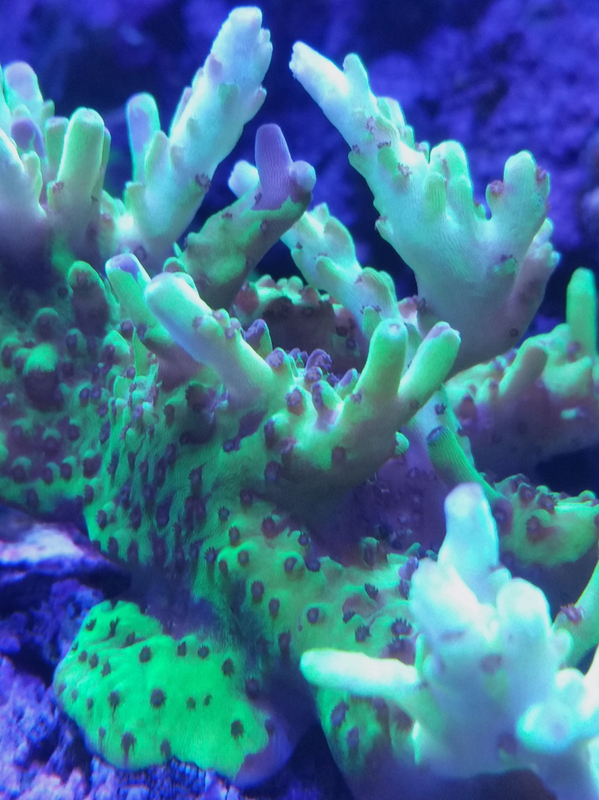 Idaho coral farmer Marty Bakker bought this Acropora originally from an online vendor called Zoa Frag. Initially the coral was just a drab olive color, but it did grow into the typical A. efflorescens morphology. After a while, Marty placed an ORA Birds of Paradise Seriatopora coral near the A. efflorscens, but not in direct contact with the coral. The ORA Birds of Paradise grew quickly and the two corals ended up very close to each other. Then the A. efflorescens started to color up with an intense fluorescent green pigment. Branches also developed a base intense purple coloration typical of colorful efflorescens table Acropora. Marty was surprised by the intense green and did some research on this Reeffarmers web site where he learned how the original Grafted simplex took on the green fluorescent pigment. He has since assumed that was how this A. efflorescens gained the screaming green colored pigment. Looking at the upper left branch tips in the above image, it does appear to be the typical grafting pigment patterns that develop from contact grafting. Or as Steve Garrett of Garrett’s Acropolis calls it, proximity grafting. When the pigment travels up the branch in a thin line, as can be seen in one of the upper left branch tips, it is definitely a foreign grafting. Marty recommends moderate to strong lighting and water current. Reeffarmers is maintaining a seed section of this coral in a 8 foot Raceway Gyre BiZonal system. This system is naturally filtered with a semi-cryptic zone and a reef flat exposed zone. In this captive reef the coral is positioned to receive moderate to strong light and water current. The first edition fragment of this coral was sold privately. Introductory list price on December 4th 2014 was $150 for a small fragment. Chad Peters acquired the first edition fragment.